Ibrahim Omar was up before sunrise on a recent Sunday, preparing for “wudu,” his first Islamic prayer of the day. He carefully washed his hands, mouth, nose, face, arms, head, ears and feet. Then he walked into his bedroom and faced to the direction of the “qiblah” in the holy city of Mecca. Not long after his prayers, Ibrahim got dressed — long basketball shorts, a white No. 9 uniform top and a pair of Nikes — and headed to his game in the Islamic high school basketball league, which is the first organized sports league for Muslim high schools in New Jersey. It’s also a league Ibrahim, 16, helped form. A junior at Teaneck’s Al-Ghazaly High School — one of about a dozen Islamic schools across the state — Ibrahim said life as a devout Muslim can be serious at times. He studies three hours every night. He has never been on a date because his religion does not allow mingling without the intent of marriage. And he prays five times each day. So he helped start the league to introduce social and athletic opportunities to Muslim students. The 12-team league is composed mostly of North Jersey schools that play a five-game regular season through late April. The goal is to eventually join the state’s governing body for high school athletics — the New Jersey State Interscholastic Athletic Association — and play against other private and public schools. Maybe one day a Muslim player from the league will play in college. At least now, Ibrahim said, they will have a better chance. “We need these opportunities,” said Ibrahim, who grew up watching Vince Carter and the Nets when the team still played at the Meadowlands.Shortly after 8 a.m. on that recent Sunday, Ibrahim and his teammates filed into a non-descript gym at the Parsippany PAL for the league’s first game. Their uniforms read “Al-Ghazaly” across the chest in red letters. Their opponent from Teaneck warmed up across the court and women wearing “hijabs” — the traditional Islamic head wrap — sat on metal bleachers. Al-Ghazaly, founded in 1984 in Jersey City without a high school, is the oldest Islamic school in New Jersey. Most Islamic schools are privately funded and cost up to $9,000 per year in tuition. Typically, they teach a curriculum similar to other New Jersey schools, in addition to Islamic studies, Arabic and Quran — the central religious text of Islam. At Islamic schools, cursing is forbidden. Boys and girls cannot mingle outside of their class work. Discipline problems are almost unheard of, Muslims say. Ibrahim can walk down the hallways at Al-Ghazaly and name every one of his 241 classmates. He said there are no cliques and students relate with each other. The bond is made stronger through prayer, he said. Each afternoon between 1 and 2, students prepare for “dhuhr” — the second of five required prayers each day. At Noble Leadership last week, students filled the gym on the top floor of the school. In six lines, about 300 prayed together as sunlight poured through rows of windows over their shoulders. A first generation American from an Egyptian family, Khattab was a member of Al-Ghazaly’s first high school graduating class in 1992. Growing up, she said many Muslim parents regarded sports as superfluous. “The majority of Muslims feel like there are so many other things that are important to accomplish other than sports,” Khattab said. “There were other priorities because they were still establishing themselves as immigrants, as people who wanted to be financially stable. Noting that sports can develop character and instill hard work, a group of mostly younger Muslims involved with the Muslim Youth Community Center (MYCC) started a New Jersey 16-and-older basketball league in 2006. The league has grown to 28 teams across three divisions, and a branch of MYCC now has leagues for flag football and softball. As a boy, Ibrahim tagged along to the MYCC adult league to help keep stats. That’s when he said he first thought to start a high school league. Playing sports, he said, helps Muslim students relax and have fun. It is also a way for Muslims from different areas to socialize, and it helps young Muslims to get out in their communities. Some non-Muslims play in the adult league, and the high school league is also open to non-Muslims. There are roughly 400,000 Muslims and a hundred mosques across New Jersey, according to Islamic Relief Worldwide. Ibrahim and his Al-Ghazaly teammates ran the court hard against the opponent from Teaneck. They moved the ball with crisp passes and cheered after big plays. 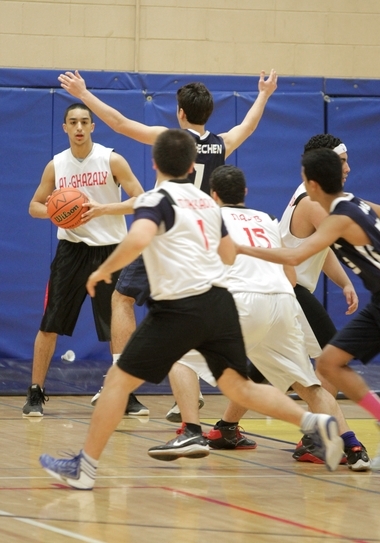 Al-Ghazaly built a 38-28 lead late in the second half behind the play of Najib, a guard. It was one of his first opportunities to showcase his talents, other than over local pickup games in Teaneck and Clifton. Abuawad says Najib — athletic and aggressive — has the skill to play at the Division 2 level in college. But Najib, who does not play AAU or summer ball, has never had a way to get noticed by college recruiters. “I would love to pursue it, and the talent that I have, I would love to showcase it,” Najib said. “Being in an Islamic school, you’re bottled in, and you can’t do that. You don’t have the chance. This league, it’s a big step forward.”Al-Ghazaly went on to win, 48-37, behind 28 points from Najib. The first day was a success, and Ibrahim headed for his friend’s car around noon with high hopes for the league. After a short drive, he arrived home to Ridgefield Park around 12:30. Before anything else, he headed to his room for his second prayer of the day.